A couple of weeks ago, people were invited to dust of all those items taking up space in the attic and register to bring them down to St Bede's Conference centre (behind St Raphael's) so as to offload them on to unsuspecting members of the public while making some money for themselves and for St Raphael’s Hospice. Well the day is fast approaching and now you too can take part in this charitable market extravaganza, by turning up, bursting wallet in hand, ready to pick off the bargains and treasures like some Renoir paintings that the unsuspecting sellers thought were merely some nice pictures accumulated by great uncle Alfred that he possibly painted himself. 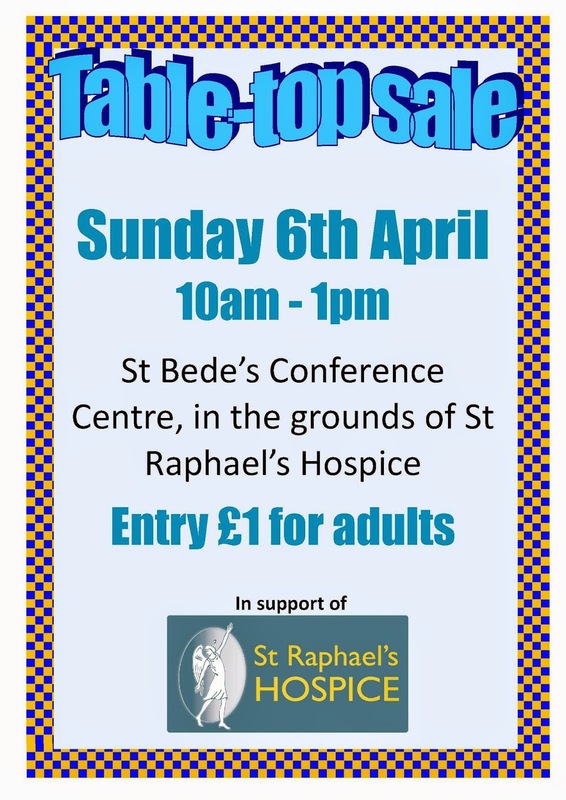 The Table Top Sale bargain hunt begins at 10am this Sunday (6th April) and only cost's £1 to get in. So get your wallets down to St Bede's Conference centre, grab a bargain and help out St Raphael's Hospice all at the same time.